Alaska apparently began as the tip of an Asian peninsula. Asia's move north swung the peninsula like a whip, pulling out Korea. Japan and Kamchatka were flung off, trailing trenches. 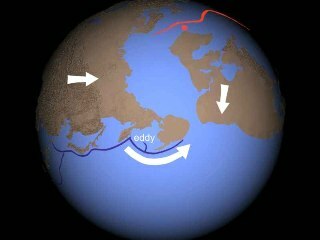 As Alaska spun away from Asia, it laid down a trench with a small eddy from the turbulence. North America was near the end of its run when Alaska hit and merged with it, raising mountains throughout Alaska. 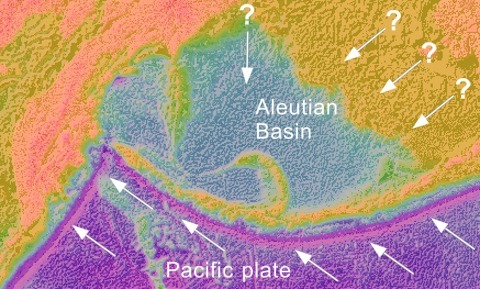 The ideas for the formation of the features of the Bering Sea are quite different in Plate Tectonics versus Shock Dynamics. The Bering Sea is bounded by Kamchatka, Siberia, Alaska, and the 3000 km-long Aleutian Ridge. It contains two curious ridges; the Shirshov Ridge and Bowers Ridge. The Shirshov Ridge extends south from Siberia, is linear, 700 km long, up to 130 km wide, and narrows at the southern end. The west slope is steep, mostly 25 - 30 degrees but up to 40 degrees, while the east slope is gentle (7 - 10 degrees).1 The "structure of the Shirshov Ridge most probably is a chaotic piling up of tectonic slabs of the crust of an ancient oceanic basin. "3 The facts "indicate intense tectonization of the basement bedrock in the Shirshov Ridge, common in structures developed by considerable horizontal compression. "3,1 Yet it was also once part of the edge (margin) of a continent, and was "torn away"4 from the continent. Bowers Ridge is an uplifted arc 700 km long. It is considered a volcanic ridge, although there is no current volcanism, there are no earthquakes (aseismic), and there is no evidence of subduction (remnant slab and trench).2 Along the north and east side is some slightly deformed sediment, then a mild dip (Bowers Trough) buried in sediment, and beyond that a small (90 meters high, 12 - 20 km wide) rise, Bowers Swell. As you can see, researchers have treated the Shirshov and Bowers Ridges as different and unrelated. But there is reason to think their origins are related. You may already have noticed the tiny curved line connecting the two. The Shock Dynamics account begins with the counterclockwise rotation of Asia. Alaska began as the end of the Siberian peninsula. 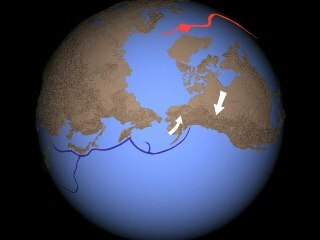 As Asia started north, inertia held back Alaska and it rammed Kamchatka. This pinched oceanic crust between Alaska and Kamchatka, providing the compression found in the Shirshov Ridge. As Asia continued north, the peninsula swung outward, tearing away the Shirshov Ridge and laying down the arc of the Aleutian Ridge. Eventually Alaska separated from the peninsula and collided with North America. 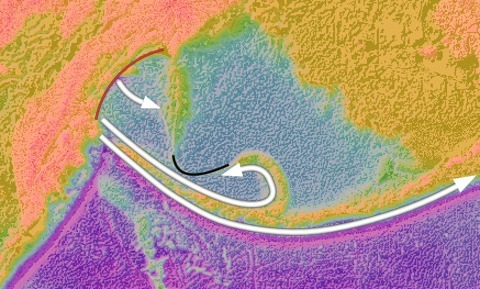 The connecting line (in black above) between the Shirshov and Bowers Ridges shows what happened. A piece of the southern tip of Shirshov Ridge was pulled off and dragged along with the Aleutian Ridge. The fluidized oceanic crust in the basin opening behind Alaska resisted the motion of the piece, and a turbulent backflowing eddy resulted. Thus light compression is on the out-thrown (east and north) side of the eddy, Bowers Ridge. That this turbulent feature 'froze' in place is consistent with the apparent Bingham fluid (temporarily fluidizes under stress) nature of the crust. Decide for yourself whether the Plate Tectonics or Shock Dynamics scenarios for the Bering Sea provide the clearest explanation. 1. Baranov, B.V., I.A. Basov, P.A. Gladkikh, A.A. Zabolotnikov, V.P. Zinkevich, M.K. Ivanov, V.V. Kepezhinskas, G.B. Rudnik, N.V. Tsukanov, O.A. Shmidt. 1984. 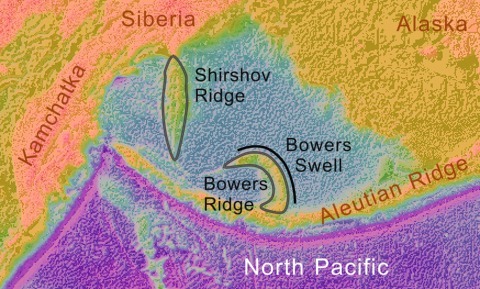 The Bedrock of the Shirshov Ridge (Bering Sea). Oceanology, Vol. 24, No. 6, pp. 703-706. 2. Marlow, Michael S., Alan K. Cooper, Shawn V. Dadisman, Eric L. Geist, Paul R. Carlson. 1990. 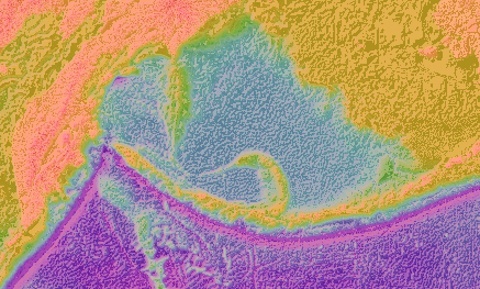 Bowers Swell: Evidence for a zone of compressive deformation concentric with Bowers Ridge, Bering Sea. Marine and Petroleum Geology, Vol. 7, November, pp. 398-408. 3. 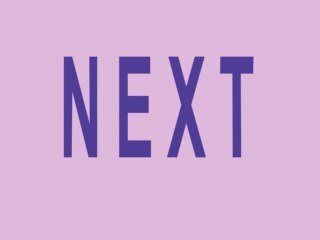 Neprochnov, Yu.P., V.V. Sedov, L.R. Merklin, V.P. Zinkevich, O.V. Levchenko, B.V. Baranov, G.B. Rudnik. 1985. Tectonics of the Shirshov Ridge, Bering Sea. 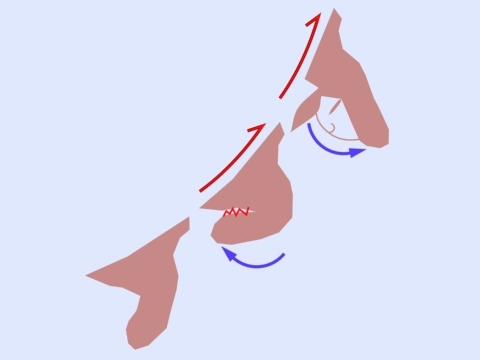 Geotectonics, Vol. 19, No. 3, pp. 194-206. 4. Shipilov, E.V., A.Yu. Yunov, Yu.I. Svistunov. 1990. Marine Geology - A Model of the Structure and Formation of Aseismic Elevations on the Ocean Floors. Oceanology, Vol. 30, No. 2, pp. 193-196. 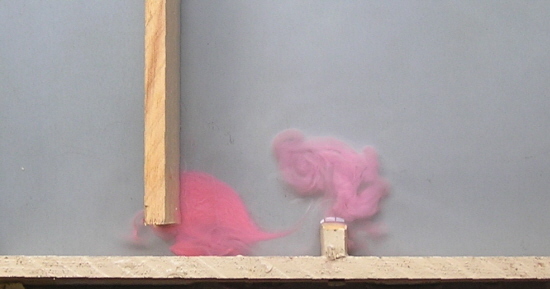 This simple demonstration illustrates the turbulence. 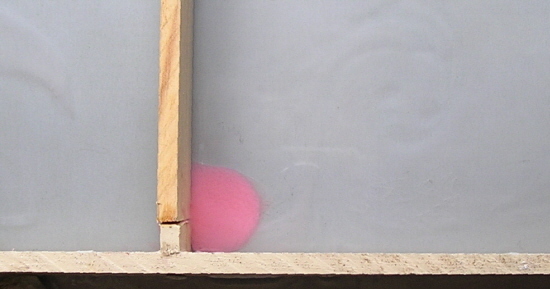 A drop of colored cream is placed at the joint of two wooden paddles in a shallow pan of water. The vertical paddle represents the Shirshov Ridge. Pulling the horizontal paddle to the right represents fluidized crust drawn behind Alaska. From: Harlow, Francis H., John P. Shannon, J. Eddie Welch. 3 September 1965. Liquid Waves by Computer. As with all accoustically fluidized crustal features in the Shock Dynamics model, once the fluidizing energy falls below a threshold level, the crust "freezes" in place. The fact that both Bowers Ridge and New Hebrides-Hunter Ridge (in presentation 13, next page) can be simulated with fluid turbulence is powerful support for the Shock Dynamics model, especially when compared to the flimsy Plate Tectonics explanations. If there is any doubt that Alaska slammed into North America along the path of the Aleutian Ridge, take a look at this topographic map. The whole southern half is arched upward. The seismic map below gives us an idea of where the suture line is between Alaska and North America. It follows the extended curve of the Aleutian Ridge. Shallow seismic waves under central Alaska show that the lithosphere is stretched along this curve (along-strike anisotropy)1, as we would expect if Alaska swung east into North America. 1. Christensen, Douglas H., Geoffrey A. Abers. 2010. Seismic anisotropy under central Alaska from SKS splitting observations. Journal of Geophysical Research, Vol. 115, B04315, pp. 1-12. 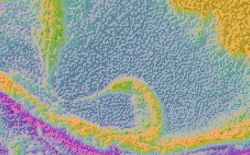 We can test Plate Tectonics and Shock Dynamics with fossils found near the North Pole. In a PBS NOVA television program "Arctic Dinosaurs", that aired October 7, 2008, the producers brought together specialists in several fields to investigate dinosaur fossils on the north coast of Alaska (the Liscomb bone bed by the Colville River on the North Slope). They uncovered a variety of dinosaur fossils. A member of the team, British paleobotanist Robert Spicer, had been studying the many types of plant fossils found in this area since 19761. He used a global statistical model to determine very precisely the average temperature of this area when the dinosaurs lived there, which the researchers believe was 70 million years ago. 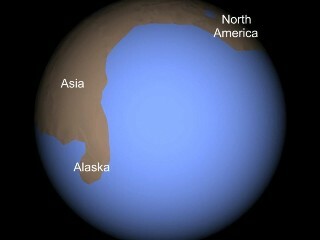 Today, the Liscomb bone bed is on a latitude of about 70 degrees N, 1,500 miles from the North Pole. Temperatures there can drop to minus 60 degrees F. According to Plate Tectonics, 70 million years ago it was much closer, only 350 miles from the North Pole, at almost 85 degrees N. But according to Shock Dynamics, Alaska was located way to the south, about the latitude of southeastern North America, before it was flung north by the impact event (see the pictures and video clip at the top of the page). What did Spicer conclude? That the average temperature when the plants lived there was about 42 degrees F, which is 30 degrees warmer than it is today. Paleoichnologist Stephen T. Hasiotis studies fossil tracks of birds, insects, and worms. He described the ancient scene this way: "Picture yourself standing on this lake shoreline. It's warm sunny; there are herds of duck-billed dinosaurs and other kinds of plant-eating dinosaurs along the lake, eating vegetation like horsetails, gingkoes, the flowering plants; an abundance of flying insects and crawling insects are on the shoreline, in the water; Theropod dinosaurs... are hunting these plant-eating dinosaurs. "8 Hans-Dieter Sues of the Smithsonian Institution added, in "the good times of the year, when it was not dark and cool, it probably would have been very similar to what we now see in the southeastern United States, with lots of conifers, lots of flowering plants. In fact, the Late Cretaceous, except for the dinosaurs, would not have been an unfamiliar environment to us. "8 This fits the Shock Dynamics model exactly, whereas Plate Tectonics must figure out how all the plants and animals thrived in a superfrozen zone 350 miles from the North Pole for many millions of years. There is a similar situation for the South Pole. 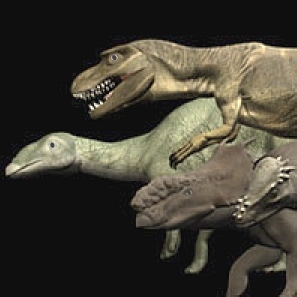 Dinosaur fossils have been found in New Zealand6 and Antarctica5 which, according to Plate Tectonics, were near the South Pole when the dinosaurs were alive. Also, one of the researchers in the "Arctic Dinosaurs" show, Tom Rich of the Museum Victoria in Australia, had first reported on a large fossil bed in Australia in 19892,7. The dinosaur fossils there are believed to date from 100 million years ago. According to Plate Tectonics, Australia was near the South Pole 100 million years ago, and those dinosaurs would have been in "an environment even colder than this one near the North Pole. "8 But according to Shock Dynamics, the center of Australia was about 10 degrees south of the equator before the giant impact, a comfortable location for dinosaurs and plants. It is clear which theory wins the polar dinosaur test. 1. Brouwers, E.M., W.A. Clemens, R.A. Spicer. 12 May 1987. Dinosaurs on the north Slope, Alaska: high latitude, latest Cretaceous environments. Science, Vol. 237, pp. 1608-1610. 2. Chinsamy, Anusuya, T. Rich, P. Vickers-Rich. June 1998. Polar Dinosaur Bone Histology. Journal of Vertebrate Paleontology, Vol. 18, No. 2, pp. 385-390. 5. Hammer, W.R., W.J. Hickerson. 6 May 1994. A crested theropod dinosaur from Antarctica. Science, Vol. 264, pp. 828-830. 6. Molnar, R.E., J. Wiffen. October 1994. A Late Cretaceous polar dinosaur fauna from New Zealand. Cretaceous Research, Vol. 15, No. 5, pp. 689-706. 7. Rich, T.H., P.V. Rich. 1989. Polar dinosaurs and biotas of the Early Cretaceous of southeastern Australia. National Geographic Research, Vol. 5, No. 1, pp. 15-53.